Obama was awakened early in the morning with news North Korea launched a rocket. 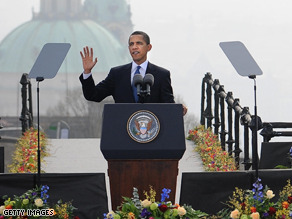 PRAGUE, Czech Republic (CNN) — Visiting Prague, Czech Republic, U.S. President Barack Obama was awakened at 4:30 a.m. Sunday with the news that North Korea had launched a rocket, as it had threatened to do over the past several weeks. During his presidential campaign, Obama and former rival Hillary Clinton debated over who would be better qualified to take a hypothetical early-morning call of an international crisis. But in Prague, where both Obama and Clinton — now Secretary of State — are participating in the European Union summit, they acted in concert. Press Secretary Robert Gibbs said he personally woke up the president to tell him the launch had been confirmed. Obama consulted with his top aides — some by phone and others in person, as some are traveling with him. They included Secretary of Defense Robert Gates, Vice Chair of the Joint Chiefs of Staff General James Cartwright, National Security Advisor General Jim Jones, Chief of Staff Rahm Emanuel and various other intelligence officials. Emerging from meetings with the Czech Republic's president and prime minister, Obama said Sunday that Clinton and the U.S. envoy to the United Nations, Susan Rice, were also "reaching out to our friends and allies" ahead of the U.N. Security Council's emergency meeting to be held in New York later in the afternoon. "North Korea made a launch this morning that defies U.N. Security Council resolutions, that harms peace and stability for Northeast Asia," the president said. Security Council Resolution 1718 prohibits the regime from conducting ballistic missile-related activities. The council adopted the resolution in 2006 after North Korea conducted a test of a nuclear weapon. "This action demands a response from the international community, including from the United Nations Security Council, to demonstrate that its resolution cannot be defied with impunity," Obama said. Obama also called on North Korea to "abandon its nuclear programs" and to "work to promote peace and stability in northeast Asia." As for the timing of the launch coming right before his speech on nuclear non-proliferation, Obama said the "launch only underscores the urgency" of his agenda. The launch was not a surprise, Gibbs said. The president has been involved in several meetings about the potential North Korea launch over the past three to four weeks, and it was anticipated and planned for. "Had at any moment we determined the launch posed a threat to the United States of America, we would have taken whatever steps were necessary to ensure the safety and security of the American people," Gibbs said.